Her Dream. 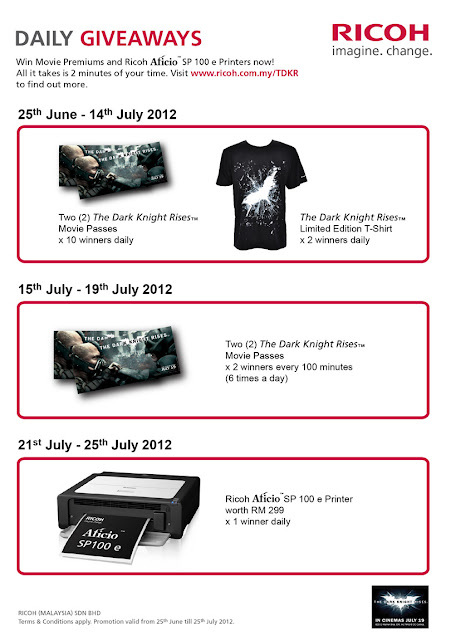 : RICOH & Dark Knight Rises! 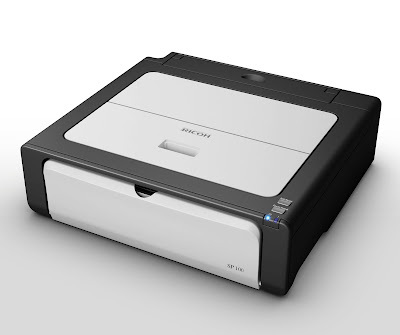 RICOH MALAYSIA has just launched its FIRST Black & White Compact Laser Printers - Aficio™ SP 100 e Series Printers! What makes it more awesome is, RICOH MALAYSIA ties up with THE DARK KNIGHT RISES™ movie, in conjunction with its release on July 19 2012. Sounds cool right? Have you heard of RICOH? 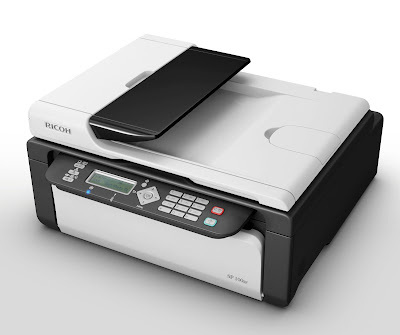 RICOH is one of the world's leading suppliers of office automation equipment, including copiers, facsimile machines, data processing systems, and related supplies. Also, it is renowned for its state-of-the-art electronic devices and photographic equipment too. Well, there are a total of three models under this series, which are SP 100 e, SP 100SU e & SP 100SF e.
Features of SP 100 e.
Features of SP 100SF e.
Definitely, providing you an option of keeping overheads low! Features of SP 100SU e.
All these 3 models are stylish, compact and portable. At the same time, model SP 100 e & SP 100SU e can print speeds up to 13ppm A4 with 16MB memory while 32MB memory for model SP 100SF e. Besides, all 3 models can print up to 1,200 x 600 dpi resolution. 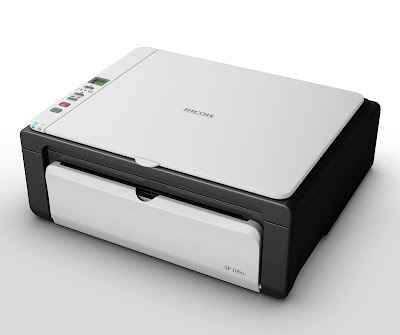 Uniquely, they are easy to use and reliable where first, it is easy to change cartridges; second, easy paper jam removal and third, fast USB connectivity. Not to mention, they are eco-friendly too! Right now, RICOH offers EXCLUSIVE REWARDS upon any purchase of the 3 models above! They have INSTANT REWARDS upon printer purchase, WEEKLY & MONTHLY REWARDS upon registering printer online. Next, there are also DAILY GIVEAWAYS too! You will stand a chance to win movie premiums and RICOH Aficio™ SP 100 e Series Printers by taking part in this giveaway! All it takes is just TWO MINUTES of your time! How? 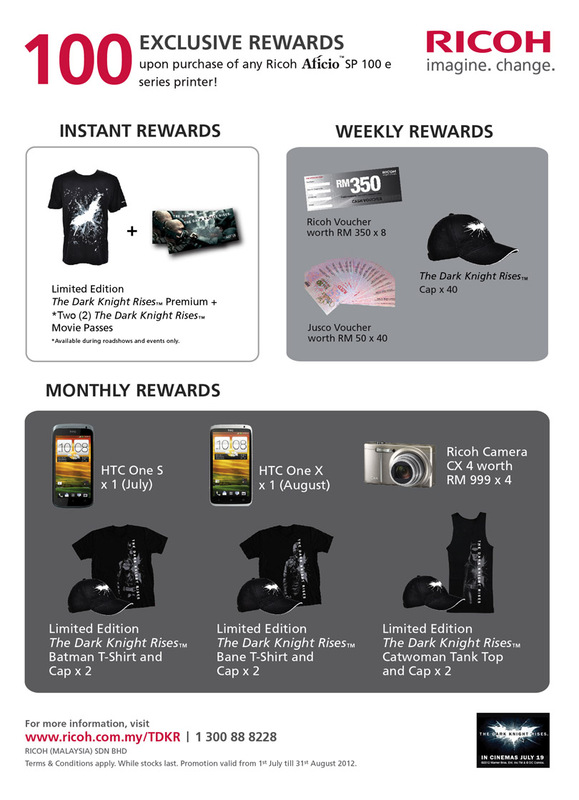 P.S List of winners will be posted on the campaign site as well as RICOH fan page every evening. Owh yeah, there will be FREE PRINTING for students at selected campus! Its FREE OF CHARGE! 1) Like RICOH MALAYSIA (Official) Fan Page. 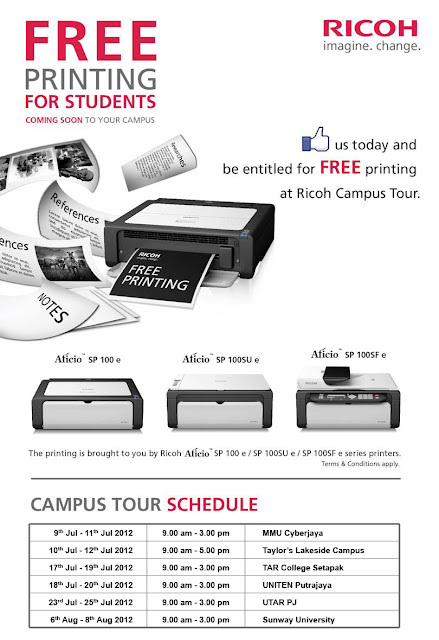 For more details, visit RICOH fan page for the updated campus tour schedule today! Awesome! I'm surprised Ricoh is still around. Haven't heard of it for a long time. Xue Ren, Luxury Haven Gets A New Facelift!! Hop on over & let me know how you feel. Appreciate your honest feedback, dear! Very good deal for student!